House arrest or forced labor awaits most of those released so far in what may be a public relations ploy. This has become one of the most common phrases heard among the Uighur, Kazakh, and Kyrgyz communities outside China, both in private conversations and online, in video testimonies and forums. With countless Turkic minorities locked away in internment camps in the country’s northwestern Xinjiang region, now loudly proclaimed by the government to be “vocational education and training programs” intended to improve lives and ensure stability, relatives outside of China have been forced to speak up. Putting aside their fears, they’ve taken to the streets, to the embassies, and to the press, putting pressure on their local governments while trying to make the world aware of the ongoing tragedy. That pressure has finally yielded a result. The camps, until now considered a one-way street for all but a lucky few, have actually begun to let people out. This so-called “letting out” has rarely meant real freedom, however, with the ex-detainees typically being shunted into other forms of the carceral network that China has built to contain the people of Xinjiang. The news, which started trickling in early this past fall and picked up toward the end of the year, has been piecemeal. The first indications that something was happening came from concerned relatives in Kazakhstan, where the local volunteer human rights organization Atajurt Eriktileri (“Homeland Volunteers”) has remained relentless in its documentation of the rights violations in Xinjiang, conducting multilanguage video interviews with the affected relatives and putting dozens of such videos up on its YouTube channel daily. Many have reported that their loved ones in Xinjiang have been released but that they’ve been placed under some sort of house arrest, with limited to no communication. More stories flooded in as the new year approached and not just from Kazakhs. Halmurat Uyghur, a young Uighur doctor-turned-activist and naturalized citizen of Finland, shocked his online following when he announced that his parents, for whom he had spent the better part of the year campaigning, had actually been released on Dec. 24. According to Halmurat Uyghur, 16 others, all Uighurs, had written to him in private with similar reports. In Kyrgyzstan’s capital of Bishkek, Zhusup Malik uulu, a young Kyrgyz store employee who also became an activist following the detention of his father, brother, and sister-in-law, showed me a WeChat conversation with a relative in Xinjiang. After nearly two years of blocked communications, he had just received news that his 72-year-old father was released and at home. This news came hours after the recently formed Committee in Support of the Chinese Kyrgyz announced that the naturalized Kyrgyz citizen Turdakun Abylet, detained in May 2017, had allegedly been released as well and was now at his home in Xinjiang’s Kizilsu prefecture—news that, however, the committee has since gone back on, claiming that Abylet’s release was staged. To date, more than 90 named individuals allegedly released over the past four months have been identified by the Xinjiang Victims Database—a project I created for documenting and monitoring the region’s detentions. The vast majority of the information has come from testimonies and interviews with the victims’ friends and relatives, in addition to public video announcements. Anecdotal accounts bring the number much higher. Serikzhan Bilash, the head of Atajurt, says the number of Kazakh releases that he has been notified of is now more than 200. Several members of the Committee in Support of the Chinese Kyrgyz, while not ready to disclose any names and figures, have confirmed to me that they’ve received similar reports for many of the detained Kyrgyz as well. One Uighur activist in Kazakhstan told me of a fellow Uighur acquaintance’s wife being released recently, and an anonymous Uighur woman in Turkey wrote me to say that she has heard the same about her mother. Coupling this with the individuals already documented and scaling, it appears safe to say that the releases are coming in the hundreds, if not thousands. In addition to Halmurat Uyghur’s parents, there are many among the allegedly released who are either high-profile individuals or those who have previously been written about. There is, for example, Erfan Hezim, the star Uighur footballer of the Jiangsu Suning club, who was detained in February 2018 and whose release was demanded in an official statement from the FIFPro players’ organization. That he had been let out was hinted at by his girlfriend in a Nov. 29 Weibo post, with a photo of a very pale Hezim on what appears to be a bus surfacing on Weibo two weeks later, accompanied by the excitement from Chinese fans that he would be back to play next season. Another notable case is that of Raqyzhan Zeinolla, an ethnic Kazakh who had been sentenced to 13 years in prison back in 2004 for espionage and, having served them out, was let out in 2017 only to be transferred directly to an internment camp. Like many others, he too now appears to be back home, released in December and under house arrest, as confirmed by his son in Kazakhstan. A preliminary statistical study of 68 released Kazakhs suggests that disproportionately many among them are women, over the age of 50, and suffering from various health issues. At least seven—Muratqan Sailau, Erbol Ergali, Zhenis Rasul, Erkin Qami, Qulzhan Zamash, Aben Oralhan, and Qalchan Amet—were reportedly hospitalized at some point during their time in the camps or shortly after. One detainee, Aqan Kulshat, allegedly had to spend more than six months in a camp despite being diagnosed with cancer, before finally being released in late November. For most of the released, the freedom obtained is only partial at best. While a large number have been placed under what appears to be surveilled house arrest, some of the documented releases were let out only to be transferred to factories or other compulsory labor. Two people whom I met in Kazakhstan talked about relatives who had been sent to the Jiafang textile factory in Xinjiang’s northern hub of Yining, lauded by state media as one of the enterprises contributing to “poverty relief” in Xinjiang by putting young locals to work. One of them was Mainur Medetbek, who said her husband, Erzhan Qurban, was in an internment camp for approximately nine months before being released on Nov. 3. About a week later, he was sent to the Jiafang factory, where he now works for a monthly salary of 600 yuan ($90), approximately a fifth of the average factory wage in China, and is allowed to visit home—and only home—once a week by organized bus shuttle. The testimony of Tursynzhan Isanali, whose wife and daughter were also interned and released to work at the same factory in October, corroborated this account. According to him, the employees had been promised 600 yuan per month but were paid only half that amount. Furthermore, his wife, Gulzira Auelkhan, and eight other women were allegedly told on Dec. 28 to sign a yearlong contract “or be sent back to camp.” Auelkhan contacted Isanali soon after to tell him of the situation, and the story made international press in the days that followed, ending with Auelkhan’s release from the factory and her return to Kazakhstan. Both of their daughters remain in Xinjiang, however. Take those lucky enough to have returned to Kazakhstan in 2018. Of the 10 to 20 ex-detainees whom I’ve heard about personally, only four—Omirbek Ali, Amanzhan Seiit, Orynbek Koksebek, and Kayrat Samarkand—have gone public about their camp experiences. Of these, only the latter two are still in Kazakhstan, while Koksebek complains of mental health and paranoia issues and Samarkand reports harassment from the authorities. 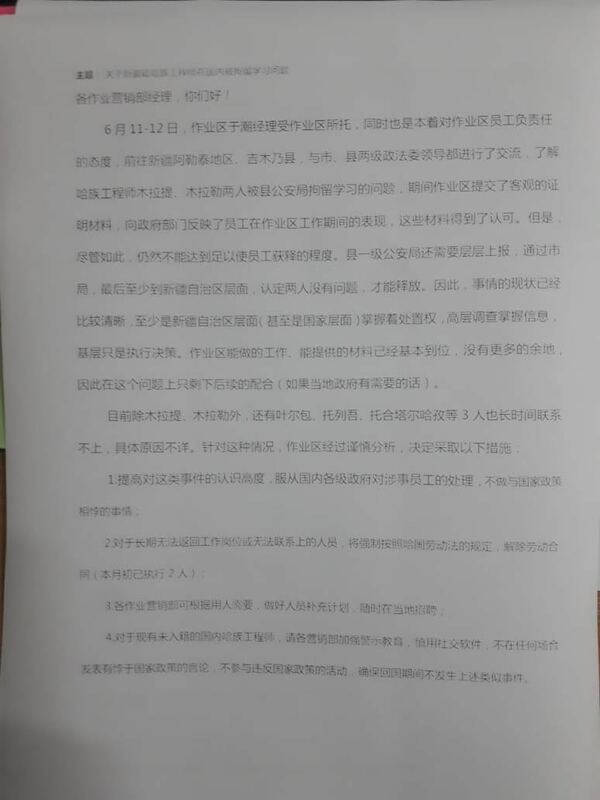 Sayragul Sauytbay, a former camp instructor who illegally fled to Kazakhstan in the spring of 2018 and spoke about the camps in court, has been allowed to remain in the country but on the de facto condition that she say nothing more about them, with some of her relatives back in Xinjiang already having been detained following her trial. One ex-detainee who has returned only recently is effectively paralyzed from saying anything about what happened to him in Xinjiang because of the dozen or so “guarantors” that the state has allegedly assigned to him—in other words, the people who will be arrested should he decide to speak out. In the meantime, communications with those released and still in Xinjiang have been bittersweet. Mural and Murat Mukan—two brothers who worked for a Kazakh branch of the China National Logging Corp. and were, despite their company’s efforts, ultimately interned in early 2018—made a short and cheery video following their recent release, saying in the video, “Happy New Year! You see? We’re at home and doing well!” For those such as Tursynbek Quanyshbek, whose mother was interned in December 2017 and whose father was interned the following spring while going to China to see her, the long-distance reunion was far less pleasant, however. “My mother’s turned into skin and bones,” Quanyshbek said, having gotten the news through his sister on WeChat prior to being deleted by her. A few days later, he reported receiving a phone call from his father, during which the latter urged his son to stop his petitioning and to not take the matter to international court, saying the authorities were treating them well. Similar conversations have been taking place elsewhere, either on the ubiquitous Chinese social media app WeChat or through phone calls from government offices in Xinjiang—often appearing as Kazakh numbers—with the relatives in Xinjiang explicitly telling those in Kazakhstan to stop petitioning for them. Nurbaqyt Qalyasqar, the mother of Razila Nural, is one of many who has refused to comply. Her 25-year-old daughter was allegedly detained in August 2017, before being released and sent to a factory a year later, and then supposedly leaving the factory in late December. Her current whereabouts remain unclear. In a recent call that lasted nearly 10 minutes, Qalyasqar pressed her daughter to return to Kazakhstan to see her sick father, only to be told by Nural that she was fine, that she was working on her own free will, and that her mother shouldn’t “believe rumors” while adding that she was never in any sort of detention. When Qalyasqar asked her daughter if she could call her in the future on that number, Nural said no, her mother couldn’t call her—only she could call her mother. The releases appear to be part of a wider Chinese attempt to create an alternative narrative of the crimes against humanity being committed in Xinjiang, especially when added to the recent state propaganda glorifying the policies and the Potemkin visits of foreign journalists and diplomats. A number of Kazakhs, for whom there appears to exist a strong correlation between petitions and releases, fear that this is a means to diffuse momentum. This sentiment is largely shared by the very outspoken Akikat Kaliolla, a musician whose parents and two brothers are still being detained despite “almost everyone who petitioned [from his county of Emin]” having seen their relatives released. Though nearly echoing Bilash’s words and admitting that his own activism will only go so far as his immediate relatives’ safety, he does state that house arrest—which he sees as being little different from internment in a camp—is still an unacceptable solution. Lately, he has made plans to travel to the United States and take his petitioning there, as he feels that he has exhausted the options in Kazakhstan. But if the releases are a ploy, then it is unlikely to work. As Maya Wang of Human Rights Watch correctly put it, the massive abuses already committed cannot be done away with through rhetorical gymnastics or, as I will add here, through nominal releases that guarantee nothing and do nothing to undo the pain, suffering, and damage already inflicted. Attempts by the state to portray the draconian as humane should elicit only ridicule when placed before the backdrop of the testimonies and petitions that continue to come in full force. In showing the world that it reacts to pressure, the Chinese state in Xinjiang has only invited more of it.